Outside characteristics of Foscam camera have changed with time and the clues below are no longer valid. The best way to ensure that you buy a Foscam camera is to check their list of recommended resellers. The best way to find out if the camera you already bought is a Foscam is to contact them directly with your device ID. You will then know if you can use firmwares found on this blog. The comparative below has been kindly posted to me by Tim who is the lucky owner of a genuine Foscam as well as a counterfeit compatible equivalent. 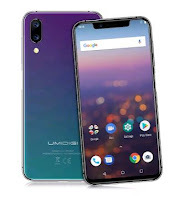 Please note that there are also legal clones with their own packaging and their own firmware, but this one is an example of intended imitation using the same packaging and the same firmware. While it seems natural to buy the camera from the people who actually do the R&D work, it is nearly impossible to distinguish them before you buy. Foscam points at some resellers that provide counterfeit products on this page. According to an email from them, the newest production will finally have a distinctive label on the bottom. I've copied Tim's email below almost as is for your information (click on pictures for full size). 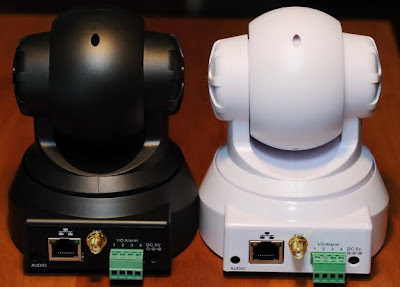 I think the outside packaging differences are not relevant as I also have slight differences on my own 2 (1 old black and 1 recent white) Foscam. One suspected difference is that the fakes seem to all have the same MAC address. Recently produced Foscam also have an improved lens filter following our numerous complains about the weird colors restitution. Here, the black unit is the fake one! In all of the photos below the genuine Foscam items are on the right. As I mentioned, I now own both a genuine Foscam FI8908W which I obtained from a US source and a counterfeit one which I bought online at DealExtreme.com. Although I did not specify which color I wanted, the US source sent me a (genuine) white one and the fake one is black. As most people have found out it is getting very difficult to tell the difference. 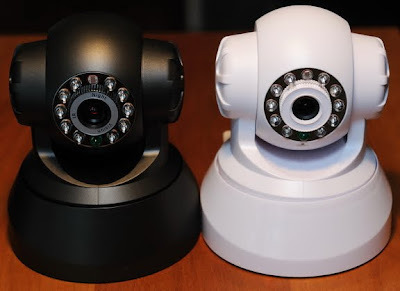 Both of these IP cameras are running the newest firmware, versions 2.4.8.12.bin and lr_cmos_11_14_1_43.bin. Neither came with the latest version but both accepted the flash update and are operating perfectly. The bottom scans below reflect what you had posted earlier in the thread, it is easy to tell the difference between the two. 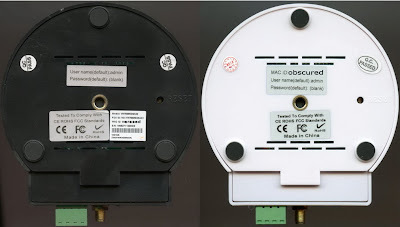 I did obscure the MAC addresses, but I think all of the fake FI8908W IP cameras come with the same MAC address which ends in :D7:63, but you might want to confirm this. The packaging is nearly identical, but there are a couple of minor differences. The genuine Foscam camera was packed inside a cardboard liner, the fake one in a white Styrofoam liner. Here is a close-up that shows the differences. Finally here are my two cameras side-by-side, notice the absence of the lens sticker on the genuine camera, else they look identical with the exception of the bottom decals. Finally, and this is a biggie, the image quality is most definitely different. The genuine Foscam has a much clearer and sharper image edge to edge than the fake Foscam, and the colors in the genuine one also are much more saturated and realistic looking. It is also very slightly wider. I set the cameras up right next to each other, the settings and firmware for each camera were identical. I also turned the lens on the front of each camera to get the image focus from each as clear as possible. My dogs volunteered to be models. You can easily see that the genuine camera is better at least in this case, I don't have any others to test. Genuine is on the right again. one other clue is that Foscam's never have inscriptions on the focus ring like the fake black one does. I bought an fi8908w from one of the genuine resellers listed on Foscam's web page. It came in a box which is very similar yet slightly different to both the boxes shown above. Inside the box, the camera and accessories were packed in a block of polyethylene foam. The camera does have the text around the lens, however I note that some of the images of the camera on Foscam's web site also show those markings, as well as the image of the camera on the genuine box shown above. So, real or fake? It's probably an authentic. The indications above were valid for a time but in recent production, Foscam added markings on the lens ring and some more labels. I understood they also would add a Foscam logo on most recent ones. My last FI8904W from "goodluckbuy.com" was also in a polyethylene protection. Dieser beitrag ist schon sehr alt. Ich bin selber Foscam Deutschland distributor. Da gibt es schon einige veränderungen. It was true at time of writing, November 2009.